See original concept sketches on gallery around the bar at the Texas Roadhouse in Chantilly, VA. 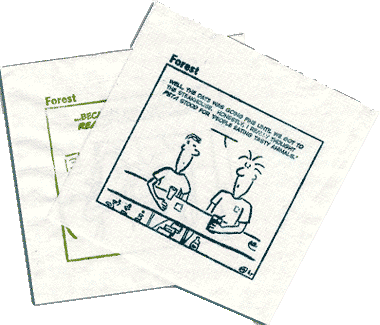 I'm starting a collection of napkin portraits of people secretly featured in the comic strips. You'd never think the staff of the Roadhouse would pick on me, would you? Here's proof. Forest is now answering email at [email protected]. Let's be clear about this: you're talking to the characters in the strip. Update: It was bound to happen; some idiot page scraped the email address without realizing this isn't a person, but a cartoon character, behind it. But now they're forging spam from that email address, hoping it's valid and to send bounced messages back our way.